Just like any genre, horror is occasionally dominated by one kind of mechanic or trope, and things can occasionally get a bit stale. 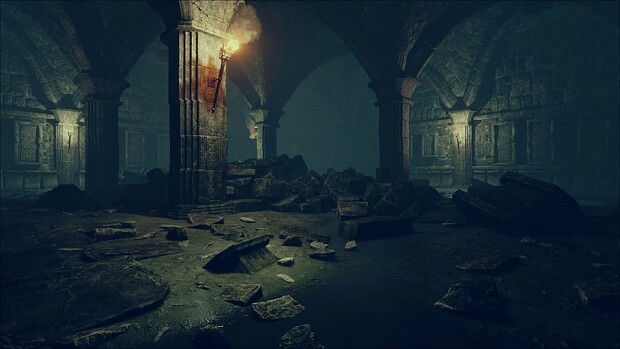 It looks like we won’t have to worry about that in Stifled, a game that used echolocation (seeing the environment around you using echoes to pinpoint the location of objects) to bring horror to the hopefully silent homes of horror gamers. Stifled, which is being developed by Gattai Games as a spiritual successor to Lurking, an award-winning student project of a similar nature, uses sounds to immerse the gamer into an experience where they may have to hold their breath in real-life, in fear of making a single noise. You see, gamers will explore the environments of Stifled using echolocation. Every noise made, whether in the virtual world or the real-world (via your mic), will help gamers to see what is in front of them. The only problem with this is that the creatures hiding in the dark will hear you, and come running. What I imagine will follow, based on my experience with a similarly interesting iOS game called DarkEcho, which has kept me entertained and tense throughout many train journeys, is a balance between wanting to see the world around you, and not wanting to die. Stifled doesn’t yet have a firm release date, but Gattai Games are aiming to have people holding their breath in fear sometime in 2015. Listen out for more concrete info on Stifled’s Twitter, or even the studio’s Twitter. Make sure you’re quiet. Working on a horror game of your own? Just get in touch with me on Twitter! I’m going through my 100 Days of Horror project, so I’ll need lots of horror games to get through to the end. Send me a tweet or an email and you just might get your game featured on my blog. Last week was a great week for me on Twitter. I found so many interesting looking horror games that I wanted to cover as part of my 100 Days of horror games. One such title was Vernon’s Legacy, a graphically impressive first-person horror by TripleBrick, which will have players solving the mystery of Dunkenhof Manor. After being told that your uncle died two days before, you travel to his estate, a sprawling manor with more than a few hidden secrets. It’s deserted. Alois, your uncle’s butler should be there to greet you, but he’s nowhere to be seen. Weird, right? Well, for a horror game, not really. 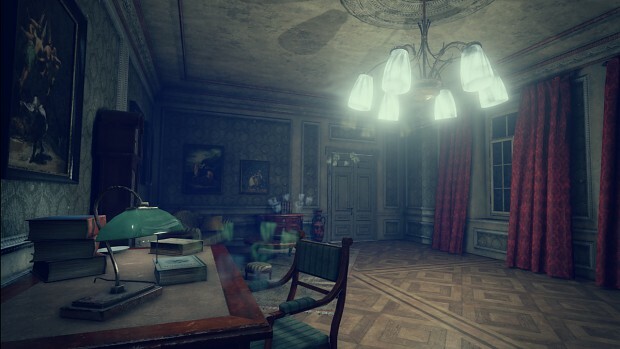 In order to find out what has happened at Dunkenhof Manor, you will be solve puzzles, find secrets, open hidden doors, and look deeper into a story that begun almost a century beforehand. 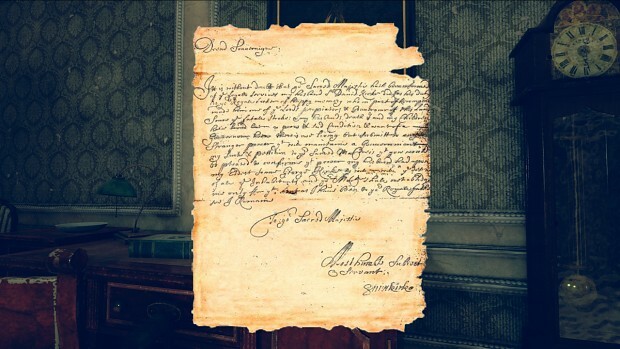 To do so, items can be kept and used when the time is right, and letters and notes lying about the manor will give you a glimpse into what has been happening inside its grand walls. From what I’ve seen of Vernon’s Legacy so far, it reminds me of Amnesia, which is no bad thing. A large manor, lots of puzzles and secrets to find, and something hidden deep underneath. I’m in. The release date is currently slated as December 2015, which isn’t really too far off. Nothing like a little Christmas nightmare. Want a little more information about Vernon’s Legacy? Follow TripleBrick on Twitter, or head to the game’s Steam or IndieDB page. Did you ever play PT? If not you should have. 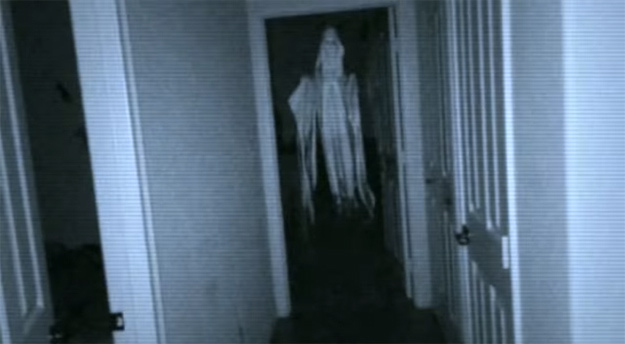 It was a teaser for Silent Hills, not that anyone knew it at the time, and it was glorious. It was strange, mysterious, confusing and utterly terrifying. Depending on what players did, experiences were slightly different, and only very specific actions led to the teaser trailer for Silent Hills, which has obviously since been cancelled, to the real horror of many people, myself included. 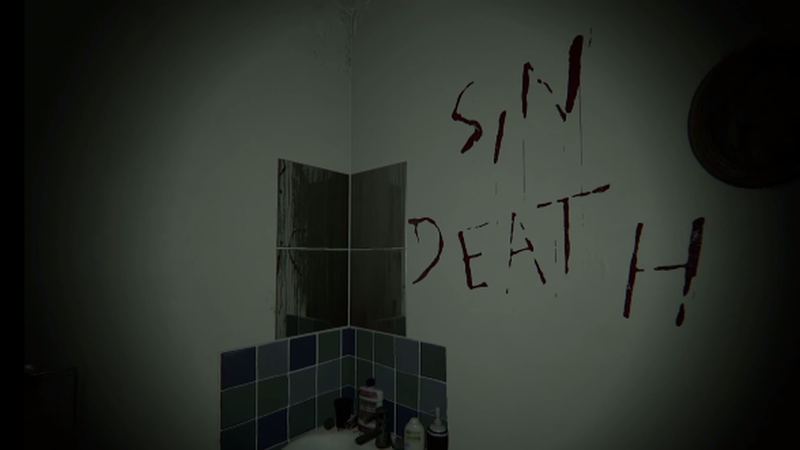 Before we all draw the blinds, stop answering calls, and sink into a depression spiral of eating, sleeping and bingeing the likes of which Netflix has never seen, let’s take a look at Allison Road, Lilith Ltd’s indie horror title currently on Kickstarter, being described as the ‘spiritual successor’ to PT. Set in Manchester, players will explore a beautifully detailed home on Allison Road, where the game gets its name. 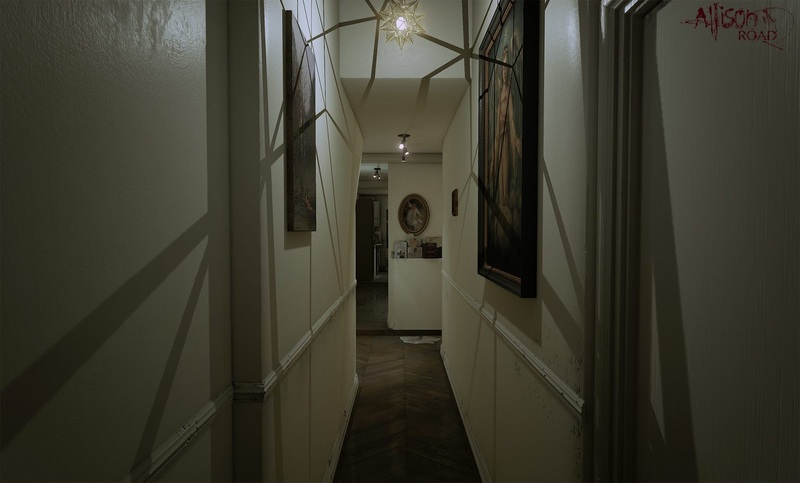 Similar to PT, Allison Road is a first-person horror where players begin to explore their surroundings without any explanation as to who they are or how they got there. As they look around the house, picking up and interacting with seemingly mundane items, menacing things are whispered to the player. And, based on the absolutely gripping and/or disturbing prototype gameplay a little further down, it doesn’t take long before something a little more physical joins you; a bloodied girl, named Lily. Everything then begins to take a nasty turn, just like in PT. When things go wrong, they go really wrong. After escaping the outstretched clutches of the unexplained girl, the player hears a scream from the woman in the apartment above their own. Then the walls begin to bleed. It. Just. Keeps. Getting. Scarier. In order to make Allison Road the complete horror success that I’m sure it deserves to be, the studio are asking for £250,000 on Kickstarter. That might seem like a lot of money, and it is, but they’ve already reached over £100,000 with around 20 days still left to go. Plus, it’s just so beautiful. Seriously. I even went to pledge a moment ago and then realised that my negative bank balance may have a problem with that… Soon, my pretty. I’ll be watching Allison Road very closely, as it has now become one of the most exciting horror titles on my radar. All I need to decide now is whether I pledge £15 for a Steam key, or £25 for a console key… Decisions, decision. Did you watch it yet? If so, I’m sorry. I know you’ll never be able to sleep again. Not yet? Oh, ignore that. You should definitely watch it. Send all underwear bills to the Allison Road Twitter account, or straight to Lilith Ltd for the more personal touch. HP Lovecraft has inspired a lot of horrors, from movies and books, to comics and video games, and now his work has become the inspiration for Unspeakable Studio’s first title, Halls of Darkness. 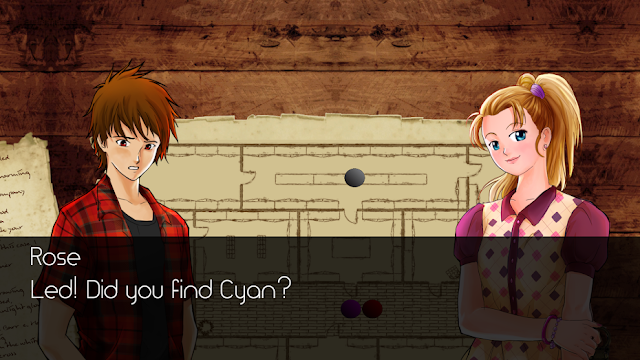 Described as a story-driven adventure horror, the studio have combined an anime art style with board game-esque qualities, and created something new for gamers to experience for free on their Android devices. 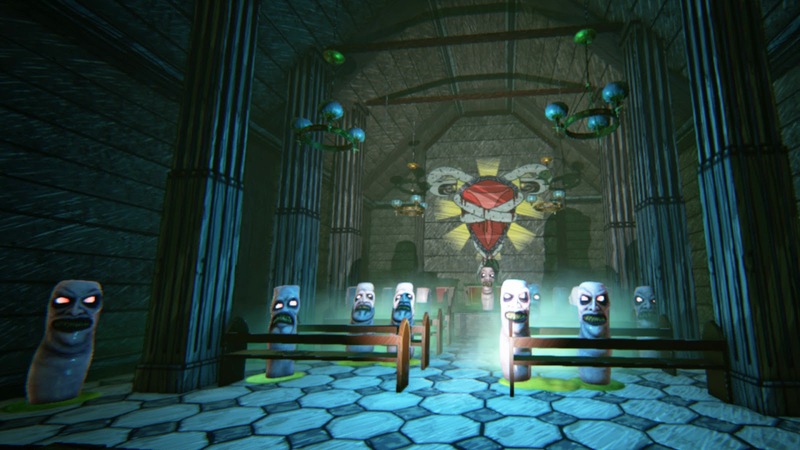 The horror adventure begins when a friend goes missing and is in danger of being sacrificed by a cult, intent of offering him up to their god. 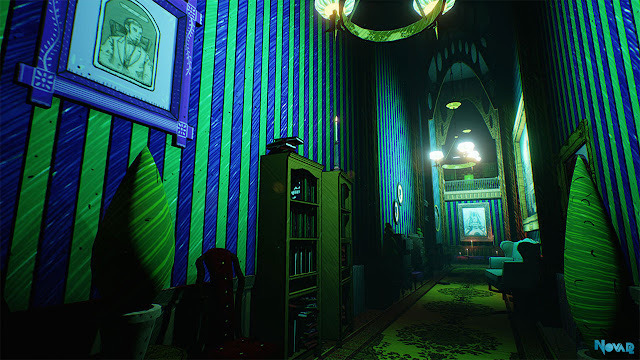 With a choice of five playable character, each with their own personality, players will explore mansions, graveyards, caves and more as they attempt to retain their own sanity in the disturbing scenarios that they will face. 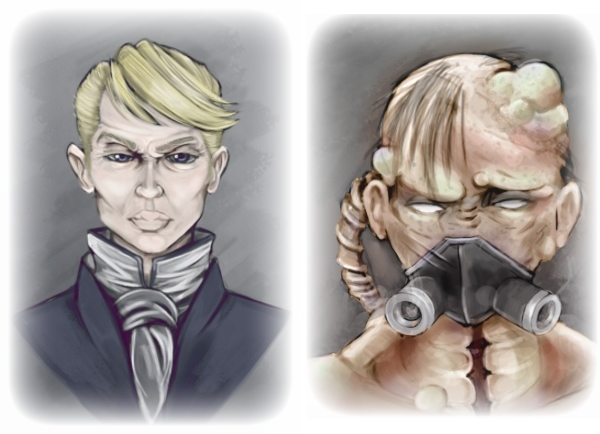 These five characters become playable after using found items to access the areas of the game where they reside. For gamers feeling in the mood for some free Lovecraftian style gameplay on their Android devices, Halls of Darkness can be downloaded on the Android store. Any more information on the game itself may be found on the game’s Facebook page. Make sure to keep an eye out for more Halls of Darkness, as the studio are hoping this will only be the first installment in a complete saga of horror adventures. Getting déjà vu right now? That may be because you read this on IGM, where my article was first featured! Did you know we also interviewed the developer? Check IGM out for all the latest on indie games, and make sure to peek in on our Patreon, where patrons can get each issue of the magazine for only $2. One of these horrors is not like the others. It’s not Sesame Street, of course, it’s Ape Law’s Albino Lullaby, and it’s not like any horror I’ve ever played. Actually, it’s not like anything I’ve ever experienced. Let me tell you why that makes this PC game worth playing, and then, in the dark of night, remembering. 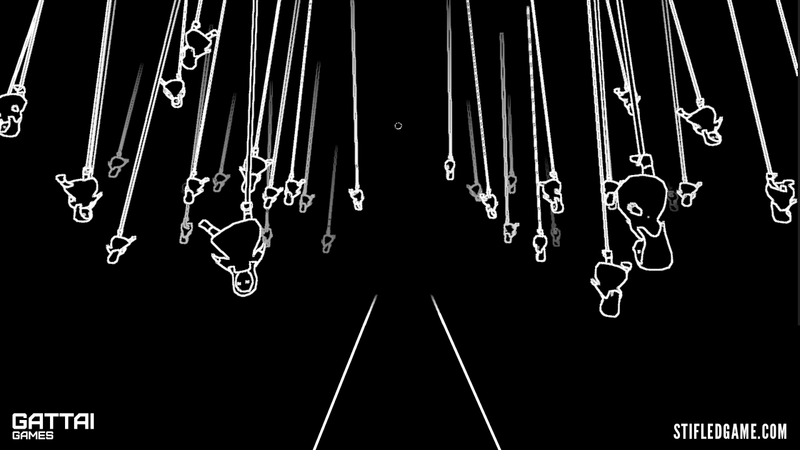 Albino Lullaby is, without doubt, the weirdest game I have ever played. I realise that sounds like an insult, but it really isn’t. In Ape Law’s game, which is aiming for a tense, eerie horror instead of all-out jump-scares, a unique sense of style, nightmarish foes and twisted, echoing dialogue are combine to create something completely horrifying in its own way. And, despite growing tension and utter creepiness throughout, the gameplay is fast and fun, urging you to go forward almost as much as your own morbid sense of curiosity. 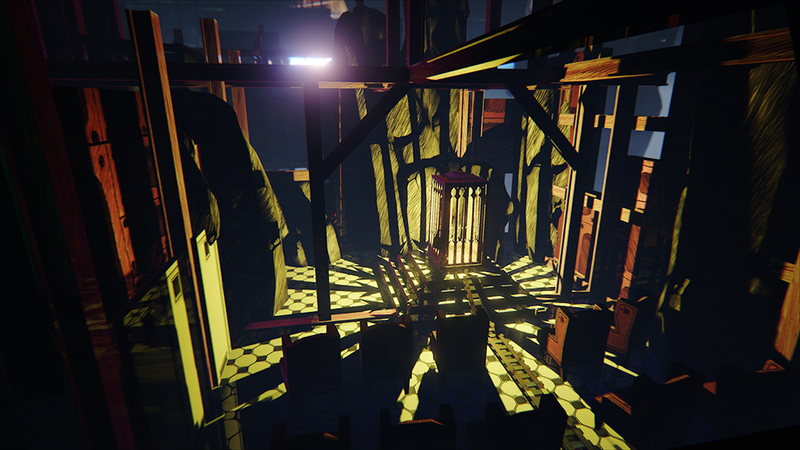 The sound design is the first thing to nail home the eerie nature of the game, as whispers beckon you to leave the cage where you begin the game. From here on out, the truly disturbing noises come from the warbling voices of the Grandchildren as they call out to you. I’ll tell you about them in a minute, whether you like it or not. Hint: you won’t. 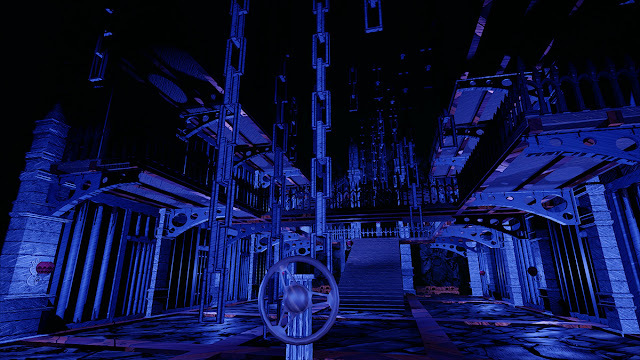 Walking through the environments of Albino Lullaby feels like walking through a funhouse. Everything seems too colourful and large, and you can’t help but find it all fascinating in an “anything could happen next” kind of way. Similar to a funhouse, it’s all incredibly easy to get turned around, especially with the amount that the rooms can change in a short space of time, but it all adds to the experience. 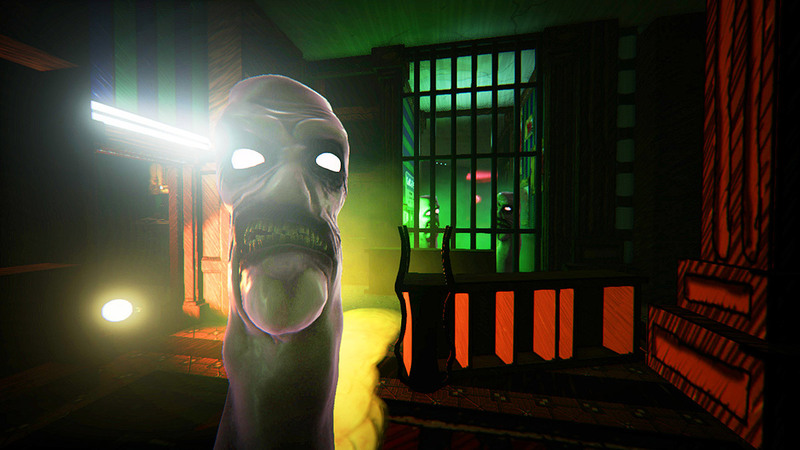 Like Bonnie first mentioned in her preview, Albino Lullaby was developed with VR in mind, and the style is sure to work perfectly for it, as the “layout and level design hold up well in terms of distance of objects, layout of hallways and rooms, and the general principle of movement.” Thanks Bonnie, you just said it so well. It is these same principles that made me feel like I wanted to explore so much of Albino Lullaby, and keep an eye out for notes of confused, almost poetic, scribbles, open every door, look through every window, and most importantly, press every button. Buttons play a huge role in the game, regularly used as part of puzzles or to entirely change the environment around you. As the floor behinds to move, and walls are flipped, added or removed, it feels like you're on a rollercoaster, never quite sure what's past the next loop, but just knowing that you have to see for yourself. For example, quite early on in the game there’s a section with buttons that say “Are you sure?” I wasn’t, at all… but I just had to know. It turns out that one by one, I was pressing buttons that would let out a crazy grandchild. Well, they’re all crazy, really. It’s time to learn about the Grandchildren. To take a quote from our newly-appointed Site Editor, “THEY LOOK LIKE TERRIFYING THUMBS,” and together they have formed some kind of worm-like cult with an eternal love for their Grandmother. Honestly, they are scary as hell. They talk nonsense amongst themselves and it’s all too tempting to sneak closer to listen in, but if they spot you, it’s time to run. Having no legs and all, the Grandchildren are quite slow. What they lack in speed, however, they more than make up for in numbers and eerie, echoing dialogue, calling after you, the intruder, with unusual phrases such as “he doesn’t say please and thank you”. Albino Lullaby has great pacing as a result, and switches between tense stealth gameplay and frantic sprinting and screaming (both the Grandchildren and yourself, as you find yourself completely lost with a group of thumb-like worms edging closer). Ape Law has made sure that you won’t feel completely helpless, though. Once the player has found matches, blue lamps can be lit and temporarily scare off the Grandchildren. Even more effective, and satisfying to use, is Buck’s clicker, which creates a brief barrier that knocks those evil thumbs out of the way like they were nothing more than slimy dominoes. There’s still a couple of issues in this otherwise impressive title, though. A couple of times I would be running away from a lone Grandchild, only to turn around and see it stuck in a wall. Another time, I jumped down onto a ledge because I was too impatient (and terrified) to wait for a door to open. I soon realised that this meant I was unable to get back to that area of the game without dying, as an entire corridor I had crept through earlier was now packed with a screaming blockage of Grandchildren. It was a minor setback, but an alternate route would have helped me out. 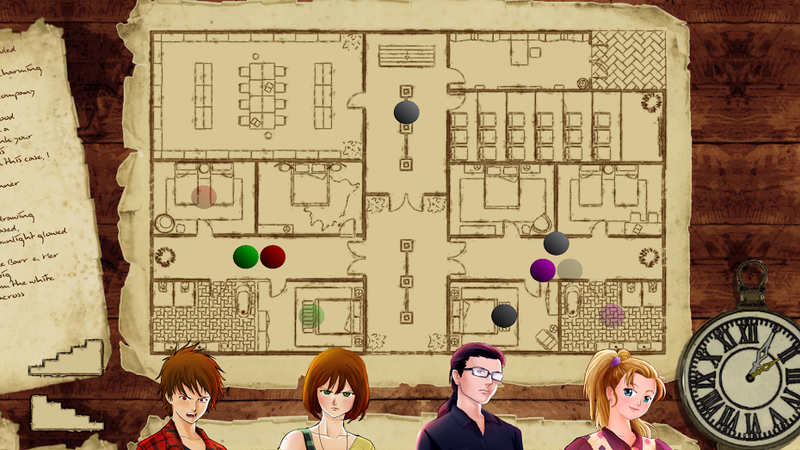 Also, on the other side of the funhouse environment coin, it can be really easy to lose track of your whereabouts. It definitely adds to the atmosphere, especially when being chased, but it’s not quite as effective when you’re trying to find a button you know you just saw. It’s a delicate balance, and one that Ape Law definitely handles well, but know that you may occasionally lose yourself in this mad world. That may mean that no player experiences any of the little technical issues that I did, and Albino Lullaby, which is already an impressively strange experience, is getting even better. Albino Lullaby: Episode 1, as I’ve already said, is one of the weirdest games I have ever played. Do you see now why I consider that a good thing? 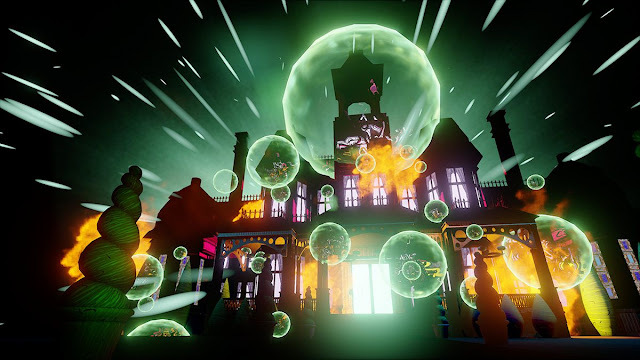 Between its unique VR-optimised visuals, surreal sound design and the unforgettable Grandchildren, Ape Law have created something worth going to bed scared for. Episode 1 is available on Steam for $9.99 USD, and there will be two more episodes before Ape Law is finished with the cult of the Grandchildren, and I plan to stick around for all of it. Grandmother would be proud. Great news, lovers of anime. Tokyo Ghoul is getting a game. This series, created by Sui Ishida and adapted into a hit anime television show in 2014, is distributed by FUNimation in the U.S and Canada, and is set to come to mobile devices in 2016. 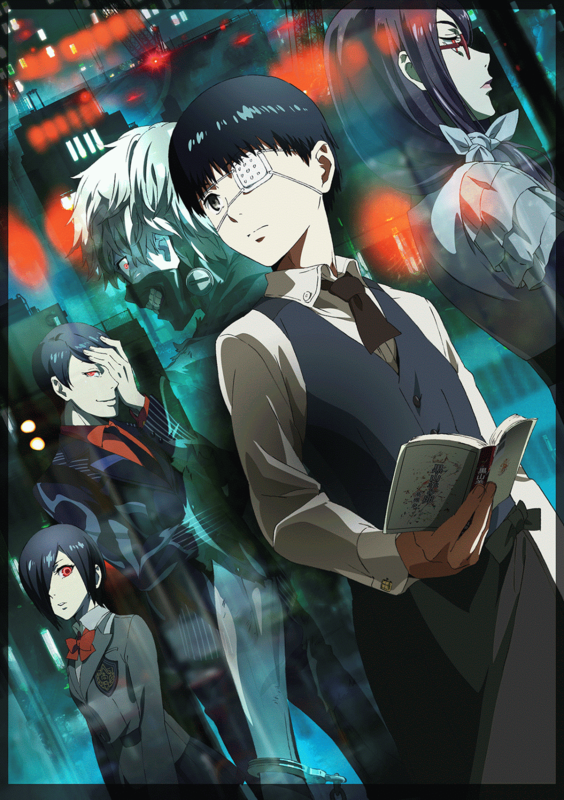 Tokyo Ghoul is set in a fictional Tokyo, where humans live in fear of beings called Ghouls. These Ghouls, whether they like it or not, can only survive by eating human flesh. In fact, some of them love it. Hunting down such ghouls is the Commission of Counter Ghoul (CCG), seen as the last thing keeping Ghouls from devouring humans whenever they please. The concept of the Tokyo Ghoul game, which will combine a mixture of RPG and action gameplay, is that gamers will choose a side; the Ghouls or the CCG. Their decision will affect the path that the game takes, as gamers choose to protect humans, or hunt them down. “Ever since we began simulcasting the anime series last year, fans of Tokyo Ghoul have been clamoring for a mobile game,” said Gen Fukunaga, CEO and President of FUNimation Entertainment. “With Season 2 now finished and Season 3 set for 2016, the anticipation for the game has only grown higher.” Count me in. 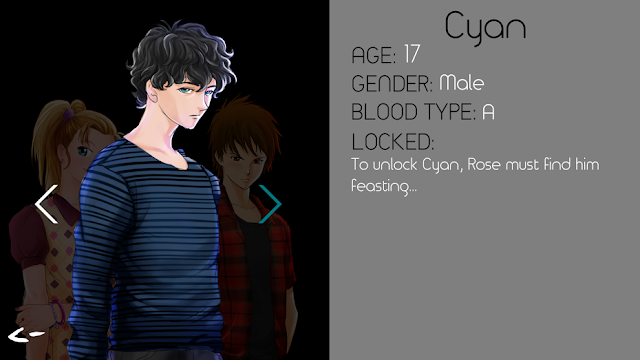 Want to know more about the flesh-eating Tokyo Ghoul game? Check out GameSamba's official website, or start a conversation on their Facebook page. It’s not very often that a priest is the protagonist of a game – or at least not the games that I’ve been playing – but in Gray Dawn, a first-person horror developed by Interactive Stone, gamers will play as a priest in 1910, and is suspected of murdering one of his altar boys. There’s two sides to every story though, and the boy actually went missing as a result of a failed exorcism. He leapt from a parish window and his body was never found. Gray Dawn aims to explore worlds of reality and the unreal, and wants to terrify gamers with a more “psychological touch”. This seems to be the way that most indie horrors are being made lately, and I’m all for it. 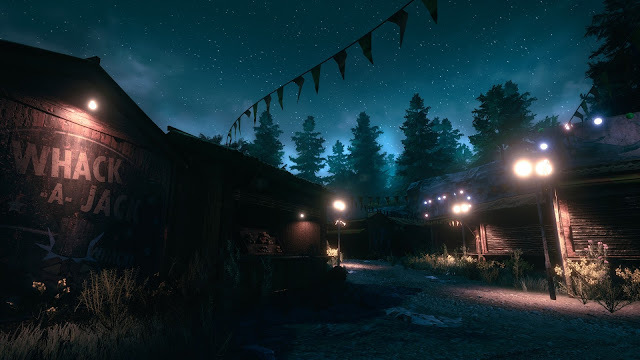 The studio has also said that their influences come from classic horror titles with story-driven puzzles, such as Alone in the Dark, Silent Hill and Resident Evil, with some room for more recent title influences like Amnesia, The Vanishing of Ethan Carter and PT. So far, so good. If you think so too, make sure to check out the game’s Kickstarter campaign, where the studio are trying to raise €50,000 (approx. £37,000) in the 19 days it has left. Pledge at least €9 (approx. £6.60) and you’ll get a Steam key for Gray Dawn when it’s released. Interactive Stone is looking to release Gray Dawn in October 2016, and I’ll be keeping an eye out for any more news or exorcised children in the meantime. I may even bother the studio on their Facebook or Twitter accounts… Based on the trailer above it already looks like a surreal horror worth watching, and is described as “bedtime story, both beautiful and scary.” Perfect. Here comes another horror announcement that is as mysterious as it is intriguing, welcome to The Park. In development by Funcom, the Norwegian studio that previously released the online F2P title, Age of Conan, this title “puts you in the shoes of a mother whose son goes missing.” It’s every parent’s worst nightmare, and it’s set in a closed amusement park... at night. Isn’t that everyone’s nightmare? 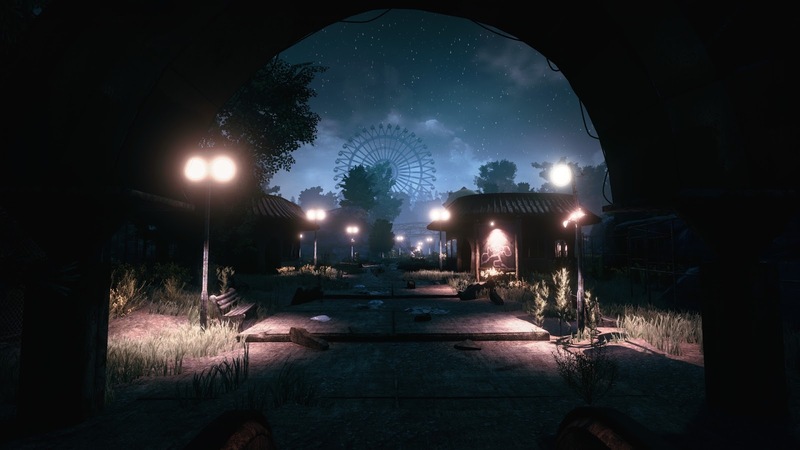 "When night falls and the lights go out, what follows is a short, but intense horror story set against the backdrop of an amusement park where a dark and sinister secret is just waiting to be uncovered." It better not be clowns. If it’s clowns, I’m out. 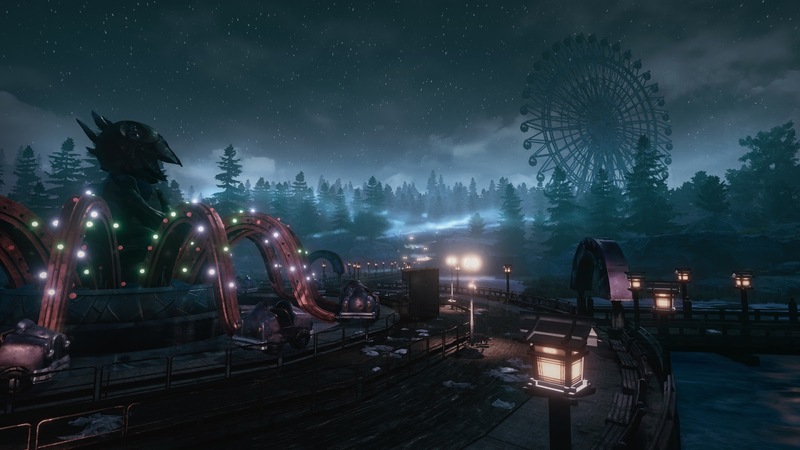 "The Park is actually the outcome of what started with a small group of developers experimenting with new concepts and looking at how we could draw upon the universes we have built for our massively multiplayer online games and expand upon them into smaller-scale single-player games," Funcom CEO Rui Casais said in a press release. And again, much like the LittleBigPlanet-esque horror, Hunger, from yesterday’s article, The Park hasn’t yet shown any more information. I'll be keeping an eye on this horror going forward and let you know if anything new is announced. I don't think we'll have to wait that long, as Funcom are aiming for an October release. 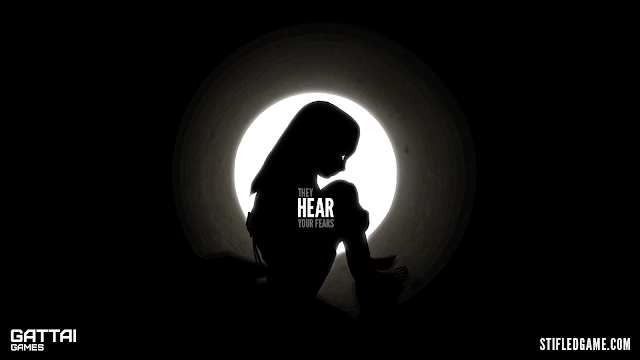 Tarsier Studios, the studio behind LittleBigPlanet on Vita and Tearaway Unfolded, announced a horror title not too long ago. It looks a little like Sackboy having a nightmare, and not too much is yet known. Here’s what we do know. Hunger follows the tale of a young girl trying to escape a place called The Maw, deep under the ocean. 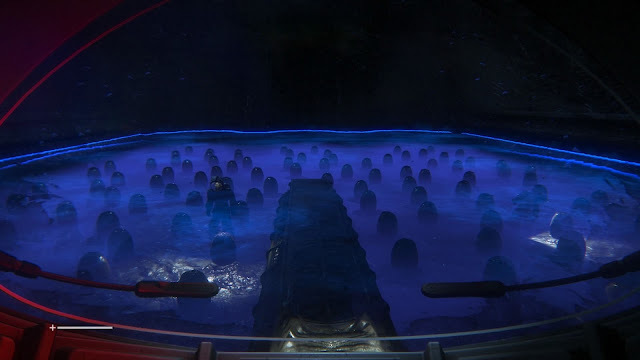 According to the trailer, someone, or something, isn’t happy about this, and will be reaching menacingly in the direction of players on their journey to the surface. I can only assume they want to play a disproportioned game of rock-paper-scissors… right? The studio has said that "at its heart, Hunger is a simple idea. A young girl is trapped in a labyrinth full of monsters and wants to escape. It will be your job to help her do this. It's a genre we're calling 'suspense-adventure', on account of the fact that there will be plenty of both. Coupled with an unnerving 'Dollhouse Perspective', tactile controls, and characters with soft, dark centres, Hunger will take your hand and let it go at the worst possible moment!" What I’m seeing is a horror LittleBigPlanet, and based on the user-created horror levels I played while I still had LBP, this isn’t a bad thing. All we need now is more information, because I’m hungry for more. 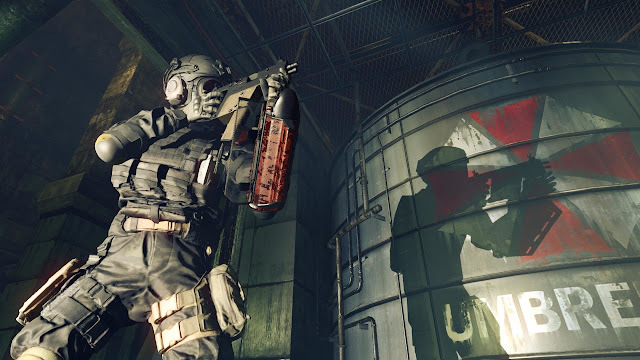 Just when we thought Resident Evil was returning to its horror roots, with the surprisingly effective Revelations 2 and upcoming Resident Evil 0 remaster, Umbrella Corps was announced. Capcom's latest spin-off is a third-person competitive multiplayer shooter set in the Resident Evil universe. For any long-time fans of the series (like myself), this couldn't be further from the kind of Resident Evil game that is wanted. Don't discount it entirely, though. While it is set in the RE universe, there won't be any RE characters involved, which at least means fan favourites can't be butchered. What Capcom is aiming for here is fast-paced action, and a way for the series to take a bite of the juicy brain that is the shooter market. Can't blame them for that, I guess. In Umbrella Corps, gamers will go head-to-head in close-quarters environments, trying to survive in a vicious battle involving humans and zombies. One idea to come from this announcement that I think we can all get behind is the 'Brainer'. This beautiful tool, which looks similar to an extra deadly ice-pick, has multiple purposes. It can be used to instantly kill another player with a swift brain incision, to turn a zombie into an undead shield, or even quickly traverse the environment. 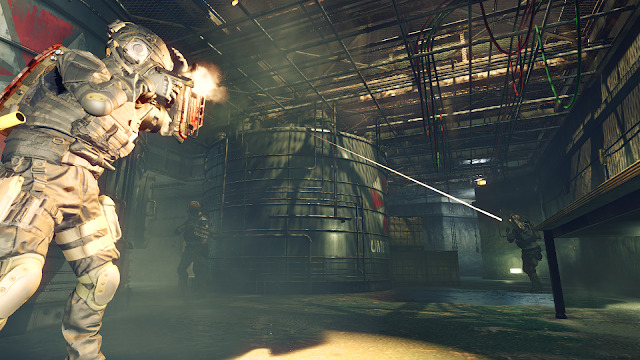 Players will also begin matches with something known as a Zombie Jammer. If this jammer gets damaged, all hell breaks loose, and zombies will swarm to the unfortunate player. 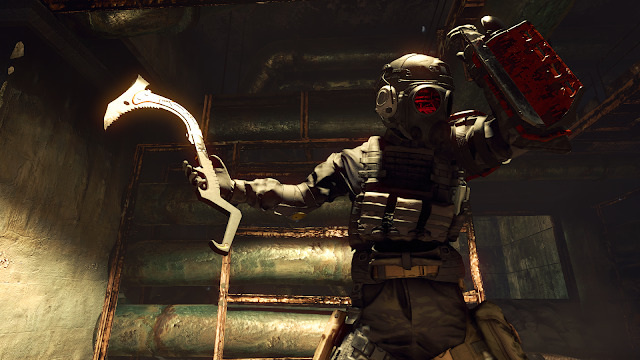 Such a device may add a little strategy to Umbrella Corps, and I'm hoping for a few extra touches like this to flesh out the experience. Only a few other details have been shared so far, including one game mode known as One Life Match. In this mode, it is three versus three, and players have one life and one life only. Once they've been shot in the face, stabbed in the brain, or devoured by zombies, all they can do is sit back and watch the match unfold. This will probably add another level of panic when a player realises that their Zombie Jammer is no longer working. Am I disappointed that Capcom are spending their time on Umbrella Corps when they should be working on a core Resident Evil game that brings the series back to the forefront of horror? Sure. Will I be holding off on judgement until I see what else the game has to offer? Definitely. 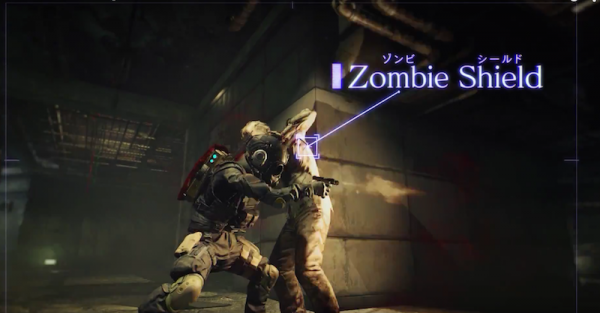 If I'm going to enjoy an upcoming shooter, it may as well have zombies in it. Gamers will take control of Jordan Baker, an investigative journalist sent to investigate the hospitalisation of Kane Rothschild, and begins looking deeper into secrets that don’t want to be found. Rothschild will feature an open world for gamers to explore, and the studio promises that there are “no closed doors or invisible walls”, so players will be able to go “as far as they dare.” As the game is procedurally generated, players will never be able to predict what is coming. Every single time you play through the game will be unique. 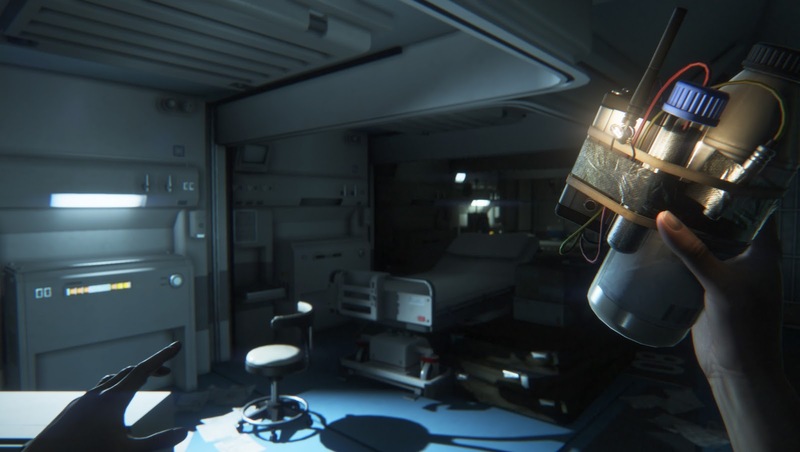 Baker’s skills can be upgraded, between categories listed as Stealth, Investigative and Sensory, giving gamers more chance of surviving the horrors. Maybe you can put a little work into Baker’s shorthand, too. Also, Rothschild boasts an interesting feature, whereby people can link their game up to their PC’s mic. If you make a noise in real life, it will be heard in-game, so stay quiet. Liking the sound of Rothschild so far? Me too. So make sure you check out their Kickstarter campaign, launched on Thursday, so that you can get the inside scoop on this game, and maybe play a part in its creation by backing the project. Loudpak are aiming to raise $7,500 USD. You can also get in touch with the studio on Twitter, which I can thank for bringing Loudpak Studios’ game to this blog, or head to the website for more information. Oh, and maybe check out their Steam page, too. It may be true that the Rothschild family run quite a big part of the world as we know it, but I can bet no-one has ever seen the family quite like this before. Working on a horror game of your own? Just get in touch with me on Twitter! I’m only on day 20 of my 100 Days of Horror project, so I’ll need lots of horror games to get through to the end. Send me a tweet or an email and you just might get your game featured on my blog. In space, no-one can hear you scream, but in game journalism, this next game heard it all. Not all of it was good. I'm talking about Alien: Isolation, of course. I'm here to tell you why most of the critics got it wrong. For starters, Isolation is the Alien title that we've all been waiting for. Finally, roid-rage marines aren't running the show. You play as Amanda Ripley, daughter of the series' heroine, Ellen, in her search for her mother. In a bold move, Amanda has boarded the Sevastopol, where her mother's last message from the Nostromo (spacecraft from the first film) is being kept. Of course, things immediately begin to go wrong. I can't be sure, but it may have something to do with the alien that's also on-board. That damn, evil, beautiful killing machine. 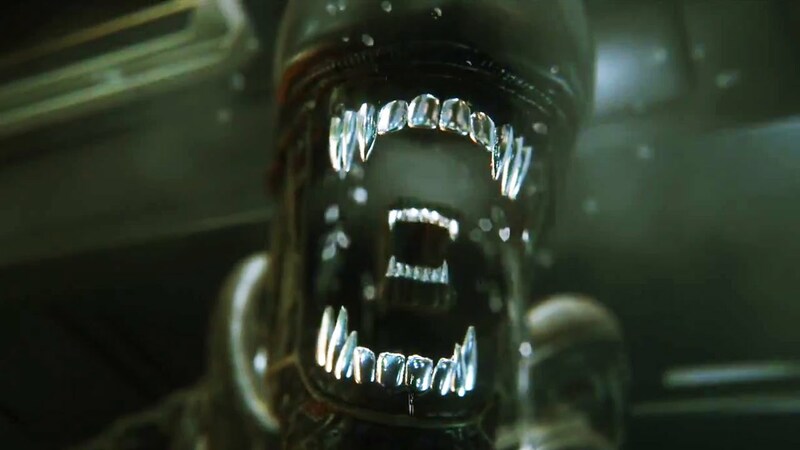 Similar to Dead Space, the ship is experiencing problems that take you all over, and one constant remains; the xenomorph is hunting you down. As you're trying to complete objectives - such as finding key cards here, or repairing systems over here - you're going to want to move slowly, keep quiet, and use the iconic motion tracker to watch over any movement in the immediate area. If you decide to run about, knock things over, or get into a firefight with one of the less-than-friendly androids that seem to have taken over the ship (I miss Bishop), the alien will join the party. One minute you're going about your own business, and the next it'll come drop into the room from a vent in the ceiling. The game has changed. Hide. It doesn't matter how you do it, but avoiding the alien at all costs is the best way to survive. Hide under a desk, crawl into a vent, climb into a locker, crouch behind something while androids and humans alike are ripped to pieces... Whatever it takes. 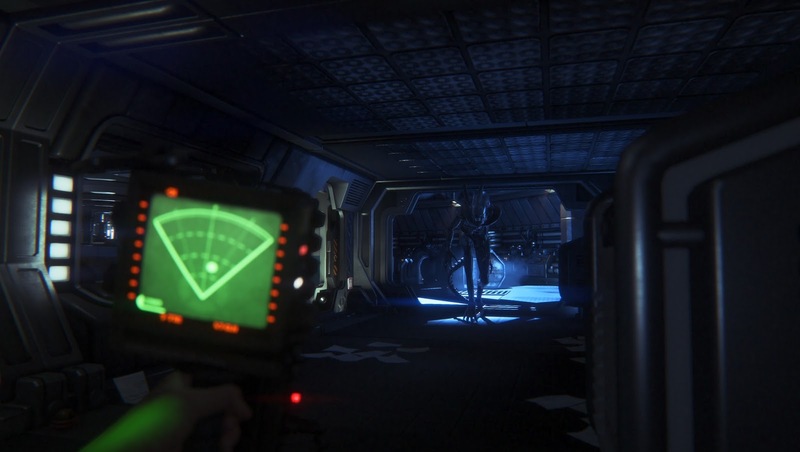 I've never felt quite as tense in a game as when I had found a hiding place and the alien stopped right by me. Sometimes it seemed to look right at me, and other times I'd watch it skulk past, its deadly tail slicing inches from my face. Other times, worse times, the alien would seem to give up, only to appear seconds later and plunge its tail through my chest or its tongue though my face. Did I mention that the dying animations are pretty cool? It's almost worth the potential heart attack. There are weapons and items that can delay the inevitable, though. Most weapons, such as the handgun or shotgun, are only effective against hostile humans or androids (which is almost all of them), and act as nothing more than a minor annoyance for the alien. That is, until you find the flamethrower. 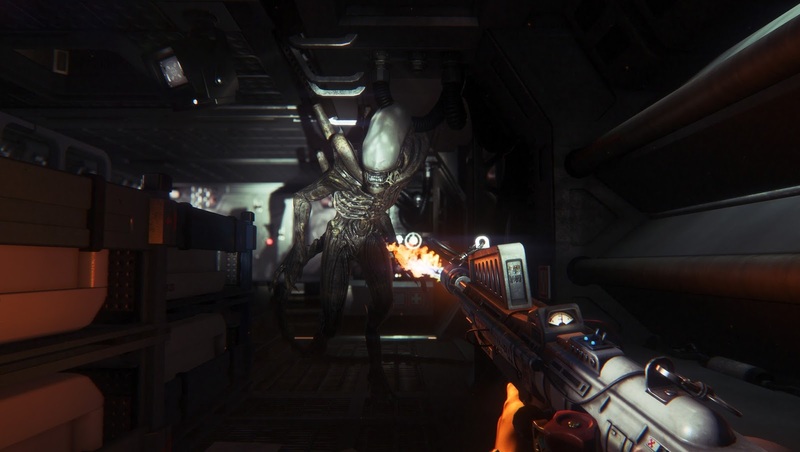 This weapon actually sends the alien screeching into the nearest vent it can find, and leaves you feeling as triumphant and badass as E. Ripley in any of the iconic flamethrower scenes from the films. Don't get too cocky though, because this only scares the alien off a few times before it won't back down at all. This is why avoidance really is the best method, and there's a couple of items that help with this. One is a 'noise maker', a device that you can place or throw, and after a few seconds it'll start making a racket. Perfect for if you need to draw the xenomorph into a specific room or area so that you can sneak past unharmed. Another possibility is the flashbang grenade, which essentially works in the same way, but for a short duration. Isolation also has a different kind of distraction at its core. It's called nostalgia, and it's a beautiful thing. Remember the spaceship with all the eggs on LV-246, where Ripley and her team first land in Alien. You get to explore it for yourself, first-hand, in a playable flashback sequence. And remember when Bishop was torn in half at the end of Aliens, in the fight against the Alien Queen. Well, at one point there's android fluid all over the floor, along with a pair of android legs. To anyone that's a first-timer to the series, this may just point to the nature of what's to come... for Alien fanatics like myself, they're Bishop’s legs. 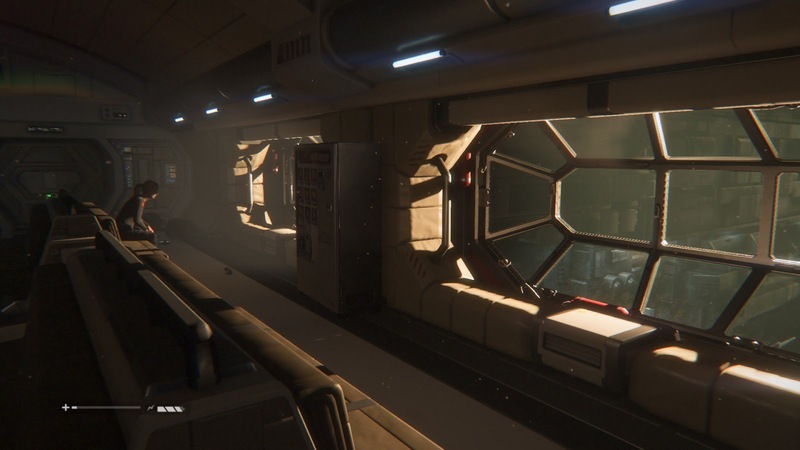 It's these little touches, and the attention to detail throughout the game, that I feel elevates Isolation above its marine-infested brethren. Sure, it can be a little much to replay one area over and over because you just keep dying. And yes, people do seem to have incredibly wet, shiny faces. But it all takes place in an environment that Ridley Scott himself would be proud of. While Isolation may not be perfect, and it's surprisingly hard, it is great for anyone looking to take themselves back into the atmosphere of the film that started it all. One Ripley, one xenomorph; that’s a tale I'm not going to get sick of anytime soon. 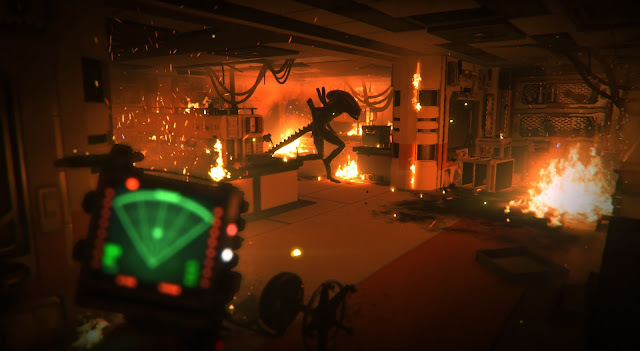 Head into Alien: Isolation without expecting a complete masterpiece and I can almost guarantee you will enjoy it. If you don't, there's a chance that you may be broken, because we're talking Ripley vs Alien, and that's a classic horror story. There's one place that should always feel safe; home. Novum Analytics disagree. 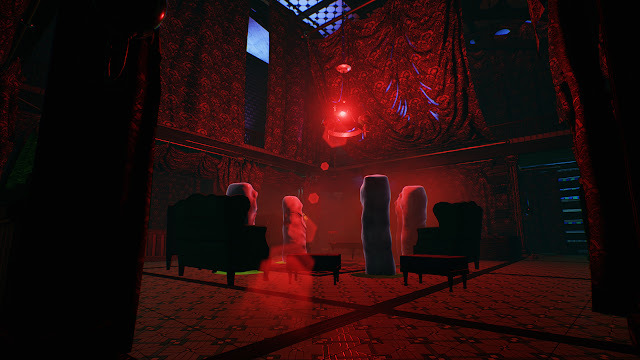 In Night Terrors, you will be able to turn absolutely any location into a horror experience that seems guaranteed to have you dropping and breaking every phone you ever have. 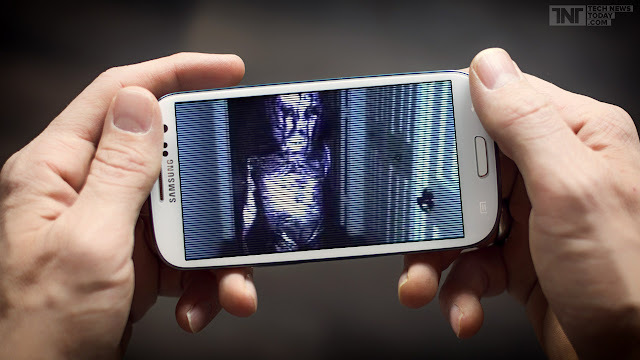 Using advanced augmented reality technology, Night Terrors, which raised almost $47,000 USD on indiegogo (although aiming for $70,000 USD), maps the environment around those playing. This is handled by “point-source modeling, environment filtering and intensity scanning”, which I am, of course, an expert in. Don’t ask me anything about it though, I’m very busy. The mapped environment then creates a completely unique horror experience for the person that is playing, and frankly blows my mind a little bit. Night Terror’s ‘narrative’ is this. How exactly you do this is another story entirely, but the studio state that this won’t involve “sitting on your couch,” and the phrase, “your signal grows stronger”, has been used. 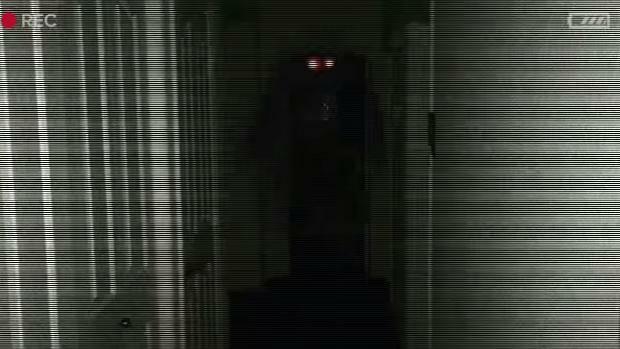 I can't help but feel Night Terrors could be the game that finally stops me using my phone at night. I may even get like 8 hours sleep - crazy! Well, unless you count the nightmares given to me by this unique AR title, briefly fitting into the palm of my hand before being dropped in fear. I'll send you the bill, Novum. If you feel like keeping up with this indie horror, check out the game’s Facebook and Twitter.